Situated opposite the Wales Millennium Centre, overlooking the Oval basin in the heart of Cardiff Bay, Demiro's has been a staple here for over 15 years. 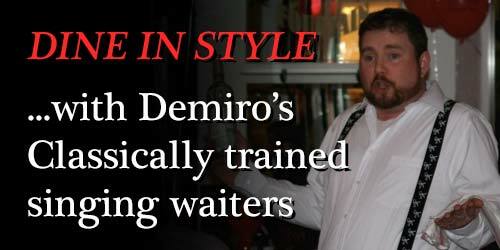 Demiro's is a comfortable and tastefully designed restaurant, offering excellent cuisine from Wales, Italy & Spain. With the ability to seat up to 200 persons comfortably, Demiro's can provide a wonderful atmosphere for special occasions and celebrations of all sizes.